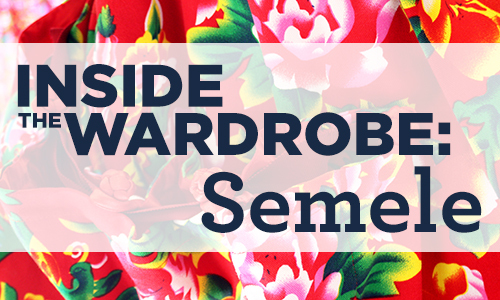 Take a close-up look behind the scenes and into the wardrobe with the costumes from our production of Semele, designed by internationally renowned fashion and costume designer Han Feng. Catch Semele in New York City when the COC presents it at the Brooklyn Academy of Music (BAM) from March 4-10, 2015! Han Feng's designs combine elements of Baroque European tailoring with the patterned silks, colours and flowing fabrics of traditional Chinese theatre. Click on the arrows on the sides of the photos (they appear when you hover the cursor over them) to see various photos of the costumes, styled by COC Costume Supervisor Sandra Corazza. This jacket, worn by Jupiter for mere minutes in the production, is one of the most grand pieces among the costumes; one befitting the ruler of the gods! The rich gold in both the jacket and wings imply the grandeur and rank of the god. Despite this, he quickly removes it when he enters onstage in Act II to meet his lover Semele, taking on a human form in plain breeches and an open white shirt in order to appear in front of her. Another reason for the hasty removal may be the fact that the jacket and wings are quite heavy, making it very difficult to wear! Ambur Braid as Semele and Christopher Enns as Jupiter in the Canadian Opera Company’s Ensemble Studio performance of Semele, 2012. Photo: Michael Cooper. 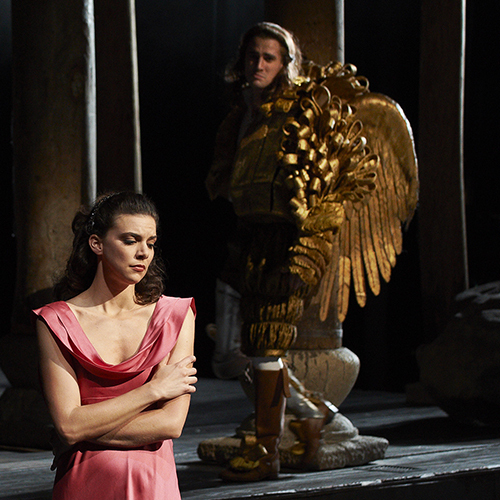 Jane Archibald as Semele (foreground) and William Burden as Jupiter (background) in the Canadian Opera Company production of Semele, 2012. Photo: Michael Cooper. 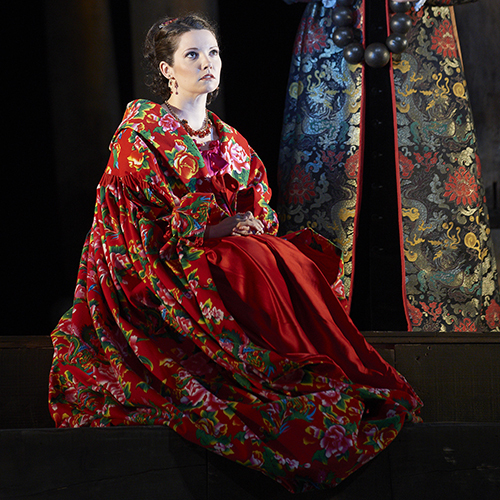 One of the brightest garments in the opera is Semele's wedding robe, which she wears with a pink dress in Act I during the preparations for her wedding to Athamas. The large, bright red pattern shows the role of colour in Chinese wedding ceremonies, where red is considered a lucky colour signifying love, prosperity and happiness. 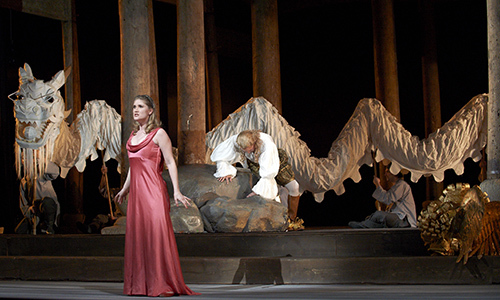 Mireille Asselin as Semele and Philippe Sly as Cadmus (background) in the Canadian Opera Company’s Ensemble Studio performance of Semele, 2012. Photo: Michael Cooper. Semele, the woman whom Jupiter falls in love with, has several costumes throughout the opera. This silk dress is paired with a large pink robe in a heavier silk fabric, but is quickly removed during Act II when Jupiter arrives to romance her. The backless look of the dress also imitates the pink silk dress Semele wears in Act III, while the cut of this one, with its wrap effect and flutter sleeves, implies that it is being worn in a more casual, relaxed setting, like a nightgown or undergarment. Jane Archibald as Semele and William Burden as Jupiter in the Canadian Opera Company production of Semele, 2012. Photo: Michael Cooper. Juno, Jupiter's wife, appears in several outfits throughout the opera. Her main costume however is comprised of a black silk corset, full skirt, and purple velvet bolero jacket, all suggesting her royal stature and rank as a goddess and Jupiter's wife. The coiled and piled nature of her pearl necklace also mimics the wig paired with the costume, which features a beehive hairstyle formed from braids. Rihab Chaieb as Juno in the Canadian Opera Company’s Ensemble Studio performance of Semele, 2012. Photo: Michael Cooper. The COC presents Semele at the Brooklyn Academy of Music from March 4-10, 2015. For more information or to buy tickets, visit the BAM website here. 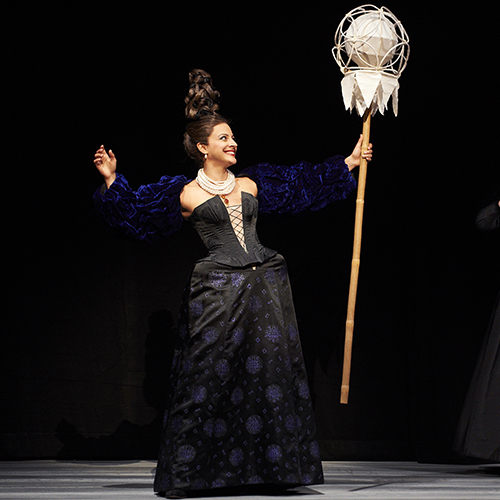 Costume photo credits: Costumes from the Canadian Opera Company production of Semele, 2015. Director and set designer Zhang Huan, costume designer Han Feng. Costume styling: Sandra Corazza. Photos: Kiersten Hay. All production photographs: Michael Cooper.